Endovenous Radiofrequency Ablation (EVRF) therapy is a minimally invasive treatment that uses radiofrequency (RF) energy to effectively treat patients with varicose veins or chronic venous insufficiency (CVI) and who have reflux disease involving the saphenous vein. A specialist inserts a catheter into the diseased greater saphenous vein or tributary through a tiny incision. Guided by ultrasound imaging, the area surrounding the vein is injected with a mixture of saline solution and local anesthetic called tumescent. The vein will then be treated in segments for several seconds each. The catheter delivers consistent and uniform heat to contract the collagen in the vein walls, causing it to collapse and close. The incision is closed, gauze and compression bandages are applied. After the vein is sealed, blood is naturally redirected to the healthy veins that remain. 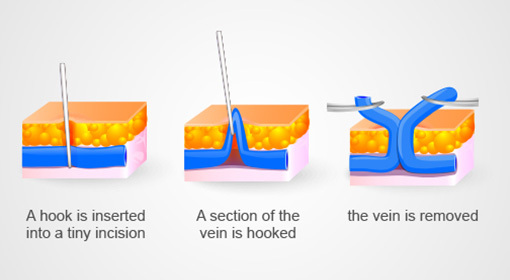 The treated vein then becomes fibrous tissue and will gradually be resorbed by the body. EVRF might be done along with another treatment for varicose veins, including phlebectomy or microphlebectomy of bulging varicose veins in the same limb. This procedure typically does not require a stay in the hospital. A specialist inserts a catheter into the diseased greater saphenous vein or tributary through a tiny incision. Guided by ultrasound imaging, the area surrounding the vein is injected with a mixture of saline solution and local anesthetic called tumescent. The vein will then be treated in segments for several seconds each. The catheter delivers consistent and uniform heat to contract the collagen in the vein walls, causing it to collapse and close. The incision is closed, gauze and compression bandages are applied. After the vein is sealed, blood is naturally redirected to the healthy veins that remain. 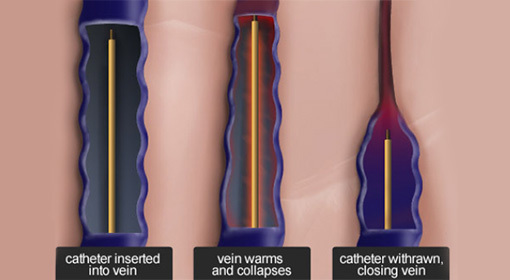 The treated vein then becomes fibrous tissue and will gradually be resorbed by the body.